In the bustling entrance hall of Peking Union Medical College Hospital (PUMCH), one of China’s best hospitals, two robot guides stood in a prominent location. They went largely ignored by the crowds shuttling back and forth. Occasionally, a curious person stopped to poke its touchscreen before moving on. Instead, most still chose to get in the long line at the information desk and speak with a human. The voice recognition robots were placed in the hospital over a year ago to provide basic information to patients as a way to free up human staff from answering the same questions about paperwork or giving directions. A hospital employee told NewsChina that the robots have done little to reduce their workload. Patients continue to ask staff the simplest questions, like the location of a particular department. “Maybe they don’t trust machines,” said an employee. The cold shoulder robots are receiving at PUMCH reflects the awkward situation AI companies in the medical sector face. Despite demand and the following investment boom, the AI sector is still far from easing the burden of China’s medical workers or becoming a feasible business. Their products’ limited performance and the hesitance of hospitals are partly to blame. AI technology, which is based on algorithms and big data, is expected to improve the accuracy and efficiency of medical diagnosis and treatment, provide patients with more convenient access to better medical services and relieve doctors from simple and repetitive tasks. The prospects are particularly appealing to a country like China, where shortages and uneven distribution of medical resources have become a big problem for everyone in what is rapidly becoming an aging society. Health statistics released in 2018 by the Organization for Economic Cooperation and Development (OECD) show that the density of China’s healthcare resources (measured in physicians per 1,000 people) grew from 1.56 in 2012 to 1.8 to 2015. However, this is still far below the average among developed countries at three per thousand. Doctors at Triple A-rated hospitals, the highest rating in China, usually work extra hours. Patients often complain about wait times of several hours only to get a few minutes in front of a doctor. Reports of doctors dying from exhaustion due to overwork or being attacked by angry patients have focused public frustration on the inadequacies of medical services in China. What’s more, the best medical resources are concentrated in big cities. Patients usually choose to go to larger hospitals in big cities without consulting doctors in smaller hospitals. According to statistics from the then China’s National Health and Family Planning Commission (now called the National Health Commission), in 2015, the number of China’s highest graded hospitals was 2,123, accounting for only 7.7 percent of the total number of Chinese hospitals. However, they saw 48.7 percent of total patients, an increase of 11.4 percent from 2010. This uneven distribution of resources and patients causes a waste of resources in small hospitals while increasing the workload for healthcare staff in big hospitals. Another factor is China’s aging population. By 2020, there will be 255 million people above 60, making up 17.8 percent of the total population. The growing demand for medical care will only exacerbate these resource shortages. It is generally hoped that AI can assist in diagnosis and treatment targeting different diseases based on big data to give smaller hospitals the same medical resources of large ones. The Chinese government has supported this field in recent years. A guideline for AI development from China’s State Council in July 2017 stressed the urgency of promoting innovative applications of AI technology to medical and elderly care. 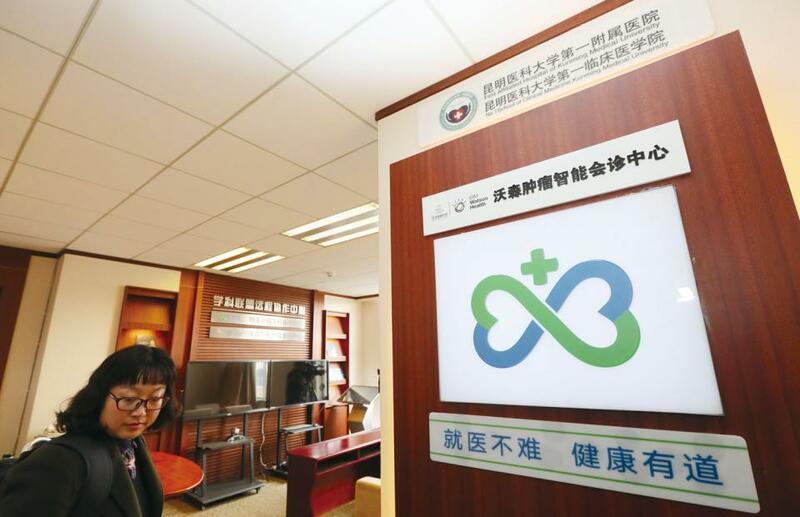 Highlighting its Internet Plus Health Care strategy released this April, the State Council encouraged using AI technology to provide telehealth services to grass-roots hospitals and develop assistance systems to improve the efficiency of medical services. The market moved before the government support. According to a report on the AI industry from the Qianzhan Industrial Research Institute, the market for AI applications in medical treatment in China reached 9.66 billion yuan (US$1.4b) in 2016, rose to over 13 billion yuan (US$1.89b) in 2017 and would leap to 20 billion yuan (US$2.9b) in 2018. Driven by policy incentives and huge market potential, financing for AI applications in healthcare grew rapidly. A report on the AI healthcare industry published in August by healthpoint.cn, a health information outlet under Caixin Media, shows that in the first half of 2018, 18 companies received 3.1 billion yuan (US$450m) of investment, 72 percent more than the total fundraising in the sector in 2017, which was over 1.8 billion yuan (US$261m). The number of companies specializing in AI-based medical products and services grew rapidly in the past few years. There were at least 144 medical AI companies in July 2017, according to a report published by Hsmap, a data platform for medical innovation and entrepreneurship. By June 2018, 89 startups had attracted investment of 21.94 billion yuan (US$3.19b), according to healthpoint.cn. Players in this arena include both traditional internet giants like Baidu, Alibaba and Tencent and AI startup tech companies like iFlytek, Yitu Technology and Infervision. The technological threshold for startups is not very high, according to Huang Jiaxiang, CEO of Wanlicloud, a service platform for medical imaging data. Huang said he witnessed how an AI team successfully trained a basic AI product using open source data in just two weeks, The Founder magazine reported. Numerous AI products are crammed into hospitals for testing and data accumulation. It has been reported that more than 1,000 medical institutions had AI products in place in 2017. Products available or under development mainly focus on virtual assistants and medical imaging, which make up the largest proportion, as well as medical robots, medical research and intelligent health management. According to a report from Iyiou, an industrial innovation service platform, AI medical imaging (particularly in detecting lung and eye diseases) and health management are currently more mature. The majority of products are still in the development and testing stages. In addition, AI healthcare products need to be consistently trained and updated with data, as well as developed for real situations. All this means demand for more technological input and constant investment before products are profitable. “The fact is that AI is popular in any related industry. Many just follow the trend, but mature products are rare,” Scott Wu, who works in an investment firm focused on the health industry, told NewsChina. Even though all kinds of products are popping up during this research financing boom, very few are good enough to be used on a daily basis or meet actual clinical needs. Currently available AI equipment can provide some help in areas such as logistics, guiding patients, assisting in diagnosis and medical imaging. But at most they are tools to help doctors avoid human error due to fatigue or stress. This supplementary role fails to meet demand for accuracy and efficiency in the prediction, diagnosis and treatment of diseases. A survey on doctors’ recognition of AI technology in medical treatment by Unicorn Workshop, a service platform for AI entrepreneurship in healthcare, in November 2017 showed that doctor satisfaction with surgery and imaging departments using AI was below average. Many doctors surveyed questioned the accuracy of AI and did not feel it was reducing their workloads. “Currently, it is mainly the AI producers that are pushing the market with wishful thinking. Hospitals and doctors are slow [to accept it],” Lu Yanxia, an analyst with market research firm IDC, told NewsChina. “After all, the products are about health. They will be of little significance if the technology is not mature enough, and doctors will be unwilling to use it for fear of risks,” Lu added. Patients are also hesitant about the reliability of AI products. “Can I totally trust them? What if something goes wrong when they are making a diagnosis or writing a prescription for me?” one Beijing resident surnamed Zhang who suffers from gastritis, told NewsChina. The quality of data is another problem. “Data is isolated. 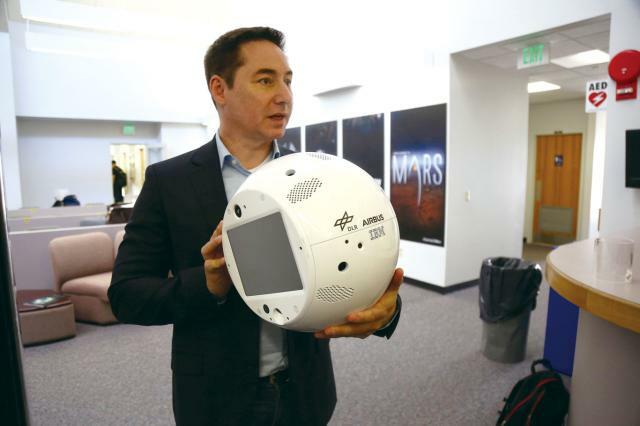 Due to a lack of a far-sighted overall design, hospitals have different systems and standards for data, which makes it hard for them to communicate and share data,” Lu said. Analysts are concerned about bubbles in the sector. “AI is hot, and there are lots of bubbles. IT specialists and companies that master AI technology are enthusiastic, but clinical application at hospitals is cold. This is not good for the development of the industry,” Qian Chaonan, vice director of Sun Yat-sen University Cancer Center, said at a conference on venture capital in Guangzhou, Guangdong Province, in June. Despite the problems or even possible winter in the short-term growth of the sector, there is still optimism for its long-term development. According to Lu, continuously increasing capital in the field’s early stages will help stimulate markets and technological developments. Lu saw China’s potential demand and its large population as a big advantage. While obtaining data is crucial in this field, Wu believed that China’s relatively loose regulations for privacy protection might turn out as an advantage for Chinese companies in data collection. Opportunities abound in this emerging market with real demand, but only players that can provide something smart and stable enough to benefit the public will succeed.